Skip the takeout! 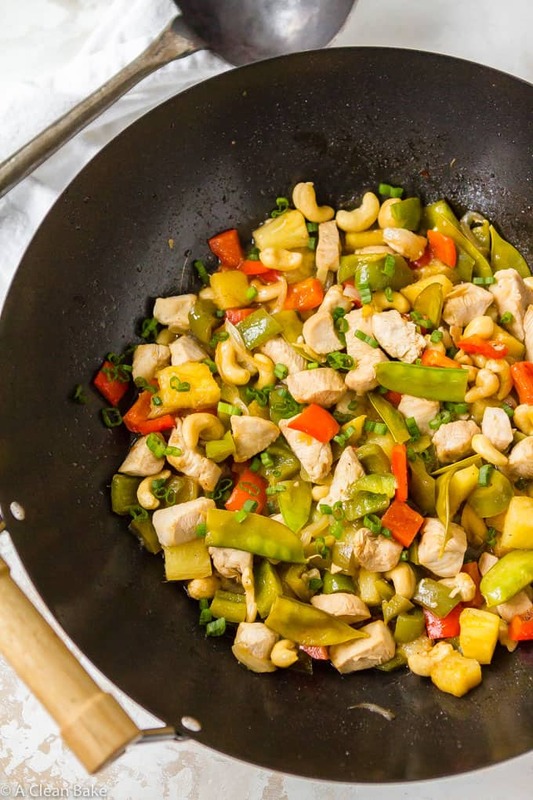 Cashew Chicken is so easy to make at home, in only one pan. Plus, it’s on the table in 30 minutes or less! If the theme of holiday dinners is abundance, the theme of the dinners in between is survival. This may be the season of special days that we set aside the time to cook and eat many courses, over a long afternoon, stretching into evening. But it doesn’t mean that, the rest of the time, we aren’t still scrambling to get dinner on the table. Although Thanksgiving is behind us, the gauntlet of the holidays continues. You may have been leisurely planning for Christmas for a couple of weeks, but I have had three family birthdays – including my own! – and Hanukkah to think about, before I could turn my attention on Christmas. With all that on my plate, it’s no wonder getting dinner on the table has been a huge hassle. What can I say? My life isn’t Insta-perfect either. There is a lot of throwing-things-in-pans cooking around here lately, the outcomes of which run the gamut from One Step Above Leftovers to Seriously, Can We Make This Again? 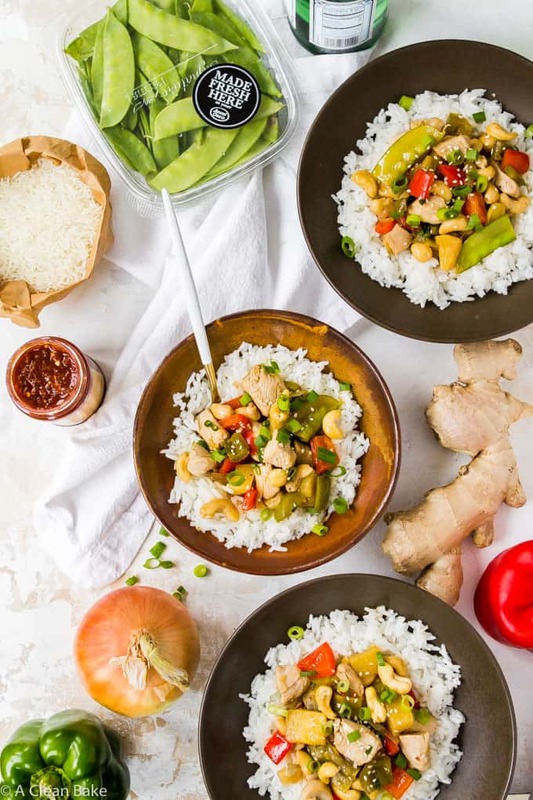 – and let’s not beat around the bush here: this cashew chicken recipe is a dinner we make again and again. 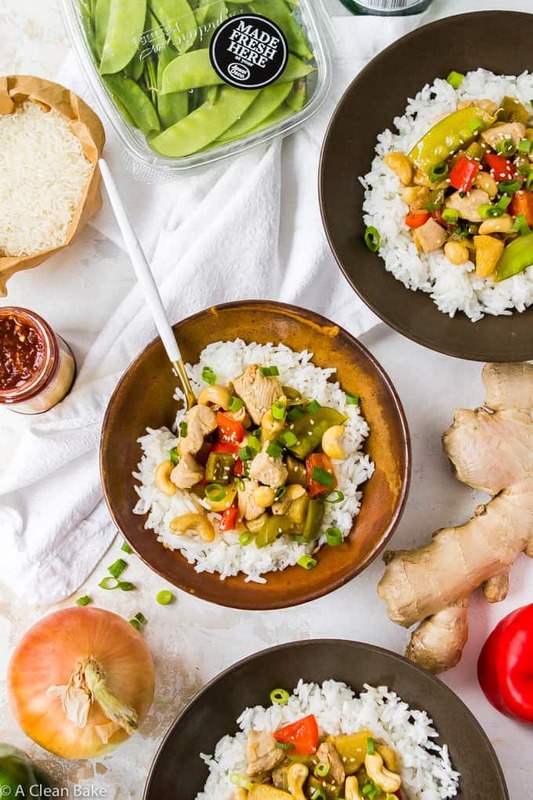 What’s so great about cashew chicken? It’s (practically) a one pot meal. The rice isn’t cooked in the same pot, but you can let the slow cooker take care of it. The cashew chicken dish, itself, is made by literally throwing everything, one after another, into a hot wok. Stir a bit. Cook it through. Serve. That’s roughly 15 minutes to chop and 15 to cook. Less, if you’re a fast chopper. It feeds four, or two with leftovers (all hail leftovers) – either way, I suspect you probably have a few extra sets of hands on, uhh, hand to help with the chopping, speeding up the prep even more. …not to mention a little something different than what you usually eat (I assume) – all made with fairly standard ingredients that you can grab at the grocery store. If 30 minutes is too much time to spare, I can sweeten the pot (wok!) for you. Here are a few ways to save even more time! 1) Meal prep. I am terrible at this, but trying to improve. This is a good meal to start practicing on, since all of the ingredients MUST be prepped ahead of time. The wok or pan needs to be hot, and things cook fast in that kind of heat, so don’t start trying to chop a pepper while the onions are frying. Just… don’t. Since you’re prepping everything before cooking, it doesn’t matter if it’s 3 minutes or 3 days before. Just make sure it’s all stored in airtight containers in the fridge until you’re ready to cook. Store the chicken and onions in their own containers; the rest of the veggies and the pineapple can be stored together; make the sauce and stash it in a jar with a tight lid. 2) Pay for a little head start. If you can’t find the time over the weekend to meal prep, I feel you. In that case, it is worth the extra investment to buy pre-chopped produce. Most grocery stores sell pre-washed and pre–chopped fruits and veggies in their produce sections. You can buy the bell peppers already chopped, use frozen chopped pineapple (much more cost effective, most likely!). I also suggest using dried spices (garlic and ginger) in this recipe to save time, but if you have a little extra time, feel free to replace them with the fresh equivalent. 3) Order your groceries online and have them delivered. I adore grocery delivery all year round, but find it particularly indispensable this time of year. It’s so worth paying for delivery, if you can find a service that has what you need, gets it to you when it’s convenient for you (not them), and doesn’t cost you an arm and a leg in hidden fees. Thank goodness for Jewel-Osco, a Chicagoland chain of supermarkets, which just launched Jewel: Home Delivery,, a grocery delivery service that allows me to shop online, reorder quickly with a Shop By History feature (which saves tons of time on stuff I buy regularly, as you can imagine), and select from same day delivery to your front door – with 1 hour delivery windows, so you’re not stuck home all day – or Drive Up & Go™ curbside pickup. Either way, it’s available seven days a week. And I have to tell you one more thing about this service: Nathan, the delivery driver who brought my most recent order, was awesome. I ordered the ingredients to arrive during the afternoon, so I could throw together a batch of cashew chicken for dinner. But a computer glitch prevented my order from being released from the store when it was scheduled, which meant I might not get my order on time. Here’s the thing: I know things happen, computers glitch and things get confused, and I don’t mind. Rather than focus on totally understandable hiccups, I always tend to remember how the company/employee I interact with handles the situation, and Nathan was seriously impressive. He kept me updated constantly, letting me know when he was leaving the store, when he was at the delivery location before me, and when he was on his way to me. When he arrived, he patiently waited while I peered inside the truck (I wanted to see the famous frozen and chilled compartments – these trucks are like a combination fridge/freezer on wheels) and took some pictures; he brought my groceries to my door, and offered to take them all the way to the kitchen for me; and, most importantly, he was super nice to Henry The Cat when he arrived. This could have been a forgettable experience, but the way Nathan (and, to be fair, the entire team at Jewel-Osco that I didn’t get to talk to, but contributed to fulfilling my order. Credit where credit is due!) handled it made me a definite return customer. So, I wanted to share this experience with you if you are in the Chicago area and want to try out the service to make your life a little easier during the holidays – or any time of year. 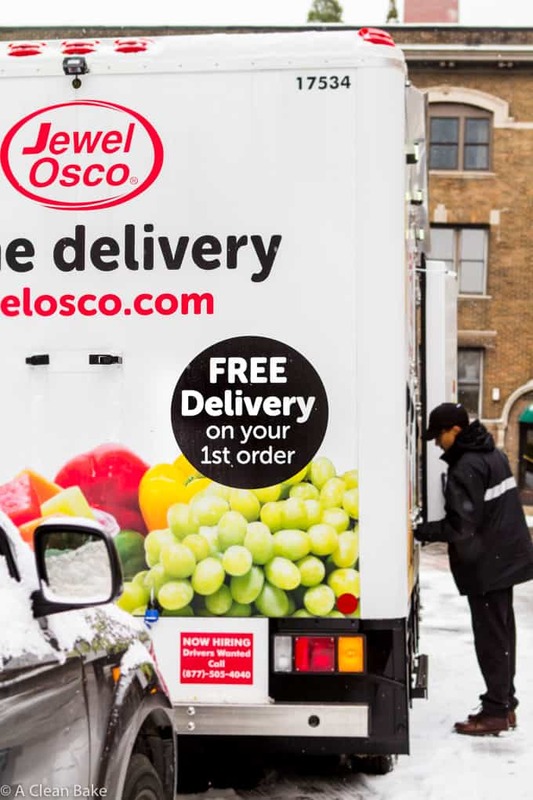 Visit shop.jewelosco.com to order online ($30 minimum order required and free delivery + $25 off of your first order of $100 or more using the promo code JEWEL before 2/28/18). Ok, I’m out of time saving tips and stories about awesome delivery guys for today. 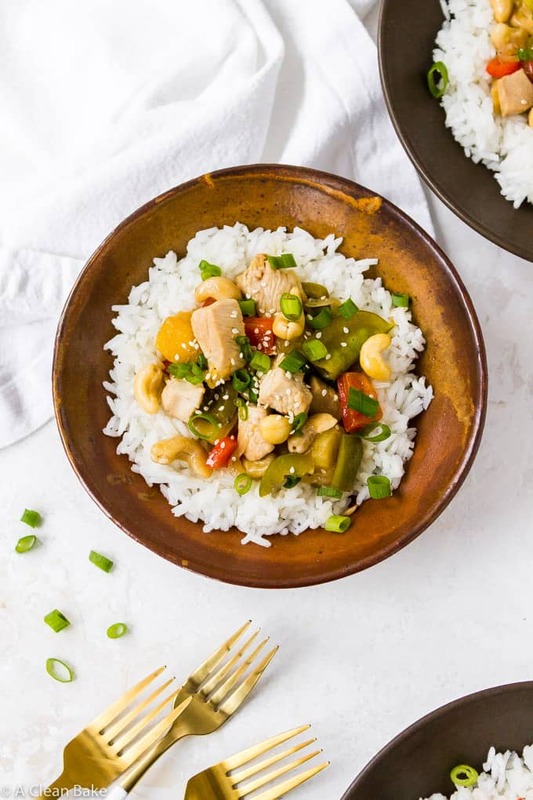 But seriously, consider this cashew chicken for dinner this week! Just because you’re tired, pressed for time, and racing to get everything done before bedtime does not mean you have to eat cold mystery leftovers. Skip the takeout! 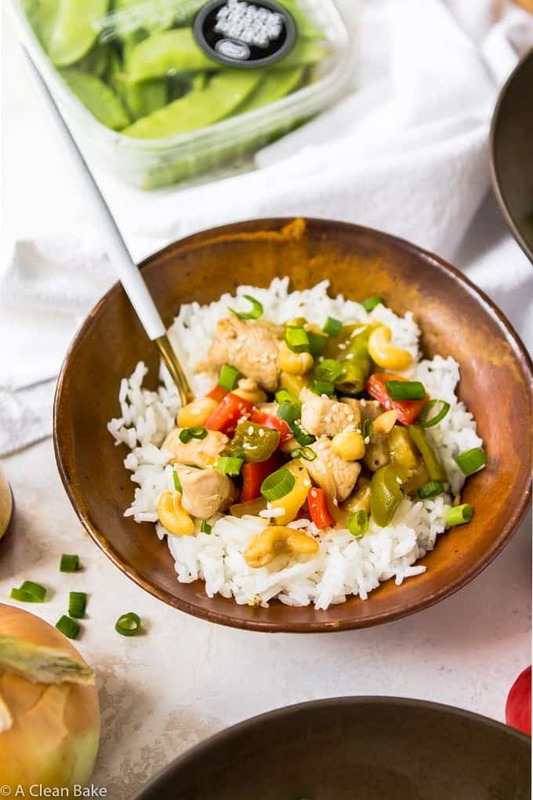 Cashew Chicken is so easy to make at home, in only one pan. Plus, it's on the table in 30 minutes or less! Make the sauce: whisk together all of the sauce ingredients in a small mixing bowl until well combined. Set aside. Make the stir fry: preheat the sesame oil in a wok or large sauté pan. Add the onions, and cook until translucent. Add the chicken, and cook until mostly white. Add the remaining vegetables, the pineapple, and the sauce and toss to combine. Cook for 10-15 minutes until chicken is cooked through, veggies are tender, and sauce is reduced. There will be some excess sauce, but it will be absorbed by the rice. Serve stir fry over rice, garnished with chopped scallions and sesame seeds, if desired. All of the ingredients MUST be prepped ahead of time. Since you're prepping everything before cooking, it doesn't matter if it's 3 minutes or 3 days before. Just make sure it's stored in airtight containers (Store the chicken and onions in their own containers; the rest of the veggies and the pineapple can be stored together; make the sauce and stash it in a jar with a tight lid) in the fridge until you're ready to cook. Store leftovers in an airtight container (with or without the rice) for up to 3 days. This is a sponsored conversation written by me on behalf of Jewel-Osco. The opinions and text are all mine. Comments submitted may be displayed on other websites owned by the sponsoring brand. This is the exact type of meal I love eating every night! So fresh, so flavorful, and so easy! Me too! It’s such a great dinner – and leftovers make the best next-day lunch! 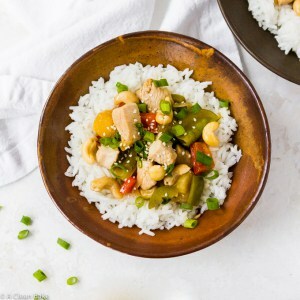 Considering this is called Cashew Chicken, where are the cashews in the recipe? I’ve read it several times to make sure I’m just not seeing it! Looks delicious though and plan to make it tonight. You’re right! That’s what I get for trying to change the make a change to the recipe formatting – it deleted that line! Thanks for catching it. Use 1 c cashews (approx – whatever you have on hand).